Wait? Pinterest? Is that really anything more than an outlet for pictures of sleeping cats, fancy home décor and items deemed orange? I’ll tell you why I love it and why, as a brand, you should love it too. One of the great things social media has done is that it’s undeniably changed the way businesses and consumers are able to interact. It broke through an imaginary wall that had long divided the two and allowed businesses to share parts of themselves which, in turn, allowed consumers to seek out businesses that are weird in the same way or that believed in the same things. Last November I spoke at TEDx about how through the Web, weird became profitable. Weird became something businesses could leverage. To me, that’s where social media is most effective – when businesses use weird to be strategically authentic and show customers their essence. It’s when they let certain parts of themselves hang out so their customers can get to know whose behind the product or service that they love so much. And that’s what Pinterest does really well. It epitomizes what is right and powerful in social media. Sure, Mashable may still use it to hoard marketing infographics for page views, but that’s not how it’s most effective. 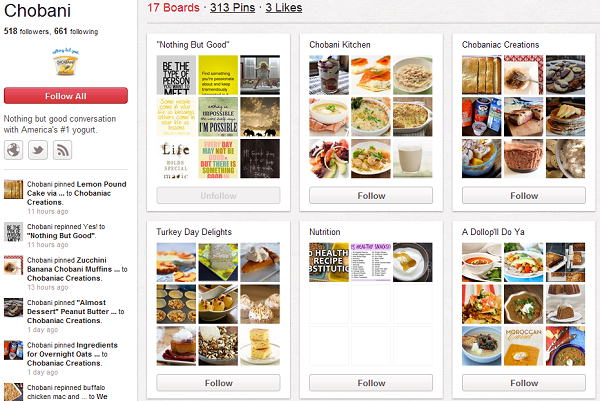 Pinterest works best when brands show customers what’s going on below the surface. When they allow consumers to see the spirit of their brand by showing them not what they do, but why they do it – what inspires them, what moves them, what the company culture is based on. They do that all through topic-specific boards. I’m a big fan of Chobani yogurt. You can find their products both in the Outspoken Media fridge and in my fridge at home. I’m also a fan of Chobani on Pinterest because instead of just trying to hawk yogurt, they give me a glimpse behind the company. Stuff that shows me not what they do, but what they’re about. Their Nothing But Good board gives me a sense of company culture, the Chobani Fit board reinforces the brand’s focus on health and wellness, and the Let’s Travel board gives another look into what they value. Sure, I know they sell yogurt, but now I get why. I see the passion behind the business. 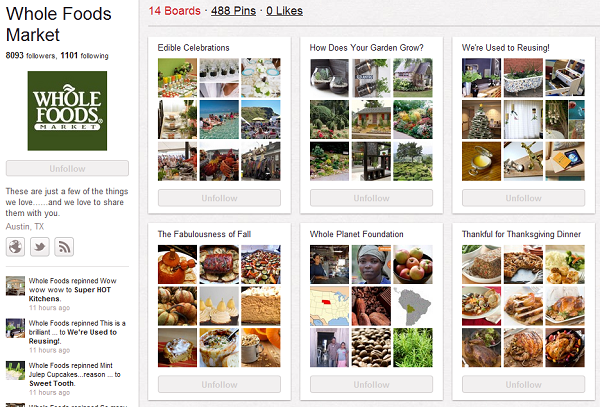 Whole Foods also uses Pinterest to show what the company is about at its core. What I like about the Whole Foods Pinterest board is that, even if I’ve never had a single encounter with the brand, based on the boards I immediately know what it represents. There are boards dedicated to the Whole Planet Foundation, the We’re Used To Reusing board shows Whole Food’s commitment to recycling, and the How Does Your Garden Grow board focuses on real gardens. Even if you’ve never been inside a Whole Foods, you get the essence. The power of Pinterest for brands is its ability to convey to customers the core of your brand, without hawking a product. Something else I really love is that it Pinterest forces brands (personal and otherwise) to think about this idea of being strategically authentic and to “pin”-point who they are, why they do what they do, and what they want people to know about them. For all the energy social media experts have spent trying to explain to people how to build their brand and how to decide what it is they want to be known for – Pinterest gave us all a visual example of how to do this simply by existing. How could you not fall in love with that? I love Pinterest as a tool to help brands cut the crap and connect with customers on a passion-level. Because that’s where business is done. 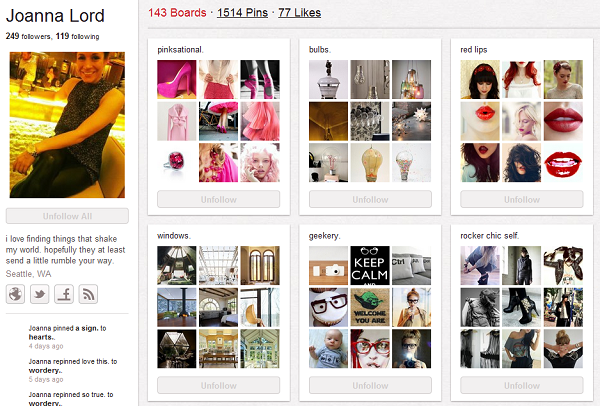 What’s your take on Pinterest? Are you using it? Ignoring it? Have you fallen in love like me?